New, improved Voidtec is a self adhesive tamper evident security seal or void label. 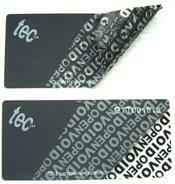 Produced from polyester tape with a high tack adhesive, it is is available in two sizes, in high contrast black, with non residue and total transfer versions. This special offer stock, is available in packs of 10 security labels, pre printed with sequential numbers and is normally available for dispatch within 2-3 days. Self adhesive, tamper evident security labels. Pre printed with sequential numbers. For bulk buy discounts, buy security labels by the roll or contact us now. ** Please note, these products are only available to purchase online, for UK mainland customers. If you wish to purchase from outside this area please do not hesitate to CONTACT US FOR A RAPID QUOTATION. All prices above exclude VAT which is added at checkout.